The following remarks are excerpted from the 2016 Alternative Federal Budget press conference, featuring Kate McInturff, David Macdonald and Peter Bleyer (March 10th, Parliament Hill). Budgets may appear to be dry, technical financial documents. In fact budgets are the product of values and they contain some of the most important choices that governments make. Today we’re releasing our 21st Alternative Federal Budget (AFB). This year’s AFB includes 23 subject chapters and is written by almost 100 contributors. Its goals are progressive: reducing poverty, redressing inequality, driving job creation and greening our economy. Over the years, the Alternative Budget has proposed policies that have been successfully implemented like the creation of a Parliamentary Budget Officer. Other ideas, like affordable childcare and a national carbon tax, we continue to advocate for. Like each of our previous 20 budgets, this budget is based on a rigorous economic and fiscal framework that’s acquired an enviable reputation in Canada and internationally. In the lead up to the new Liberal government’s first budget, our Alternative Federal Budget sets out a benchmark for what is possible. Without intervention, 2016 will see half the economic growth we’ve historically enjoyed. The pattern of slow growth doesn’t change even if we look as far out as 2020. If we maintain our present trajectory, slow growth is Canada’s future. In this period of slow growth, the federal government has not stepped in. Families have shouldered ever higher levels of indebtedness, now nearly $2 trillion dollars. And this year for the first time ever, the provinces hold more debt than the federal government. The federal government can certainly cut back services to balance its books, but households and the provinces are (the ones) left holding the bag. The Bank of Canada’s unprecedentedly low interest rates are no longer enough to encourage households to take out larger mortgages or businesses to take out loans in order to drive GDP. In fact, after inflation, the real interest on those mortgages and business loans is approaching zero. If we were to see another recession, there would be little the Bank of Canada could do to restart growth. We shouldn’t let the idea of federal deficits, even relatively large ones, scare us off making much needed investments in Canada. There is more than enough fiscal room to ensure that everyone can have a better future. It’s important to point out that mathematically one sector’s deficit is another’s surplus. Every billion dollars of federal deficits means an extra billion in after-tax income for regular Canadians, more opportunities for businesses or lower deficits for the provinces. We have updated the fiscal framework to include the March 1st GDP figures and we now are projecting an underlying deficit of $18.8 billion in 2016-17, including the $6 billion contingency fund. If Liberal platform measures are fully implemented, we predict the March 22nd budget deficit will be $29.1 billion dollars in 2016-17 decreasing to $21 billion by 2018-19. There have been signs that the Liberal government is working to repair the damage done over the past decade. But we must do more than just repair it. Today we are releasing our 21st Alternative Federal Budget. It plots an alternative path out of repeated recessions and slow growth. If implemented, the AFB would lift 1.1 million Canadians out of poverty. It would result in a net gain for 90% of Canadian families after our new taxes, transfers and programs are accounted for. Further, it would reduce unemployment to 6% by 2018-19. Its sophisticated framework breaks new ground by demonstrating the impact of our policies on income inequality and poverty. Something never before attempted in any federal or provincial budget. But one we hope governments will emulate in the future. Including all of our measures, our federal deficit would be $37.9 billion — certainly higher than the $29 billion likely to be seen on March 22nd but lower than what some Bay Street analysts are calling for. We show how a federal budget should be constructed to offset any new debt through stronger economic growth, thereby maintaining a stable debt to GDP ratio. The Alternative Federal Budget proves we can fight climate change and create jobs. It shows we can reduce poverty and grow the economy responsibly. It demonstrates we can raise the standard of living for everyone, not just for a wealthy few. Federal spending as a share of GDP is the smallest it has been since the Second World War. The last time the government spent this little money we had no national health care plan, no pension plan, and no employment insurance. Over the past decade federal revenues have been diminished by cuts to the corporate tax rate, regressive income tax policies, and tax evasion on an ever-widening scale. The Alternative Federal Budget demonstrates how progressive policy changes can shift the balance from economic growth based on the accumulation of profits by the few to economic growth based on rising employment and wages for the many. The Alternative Federal Budget would start by ensuring the most basic needs of citizens are met. We would provide clean drinking water for the 110 First Nations communities that currently live without this basic necessity and human right. We would put in place safeguards to ensure that all Canadians have access to clean water and a healthy environment for generations to come. 14% of our children live below the poverty line. The Alternative Federal Budget would lift 270,000 children out of poverty by increasing child benefits for low income families. The Alternative Federal Budget would provide affordable and accessible childcare for families who can’t afford to add $1000 a month in childcare fees to their already overburdened household budgets. 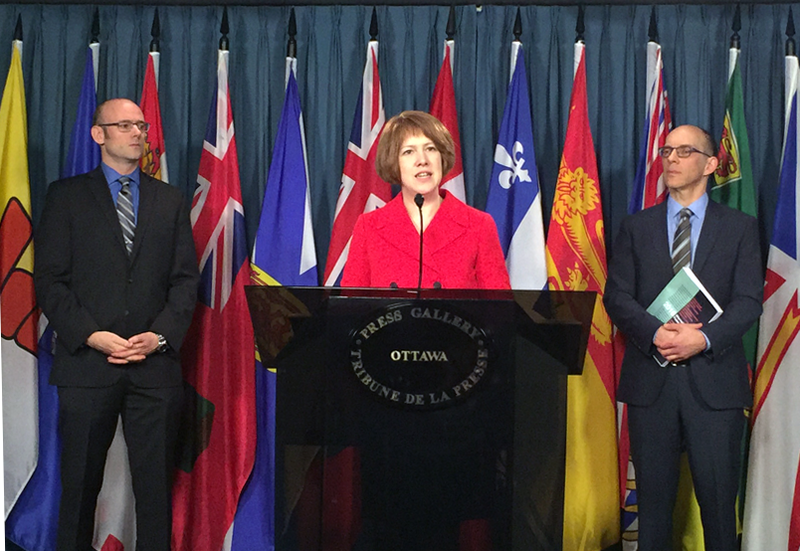 Our budget would introduce a national pharmacare program. A pharmaceutical strategy could save Canadians $11 billion dollars in annual costs for prescription medicines–43% of Canada $25 billion drug bill. Canada’s cities are becoming increasingly unaffordable, with average housing prices exceeding half a million dollars. 13% of all Canadian households are in core housing need with wait times for affordable housing measured in years, not months. The Alternative Federal Budget would ensure that Canadians can afford to live where they work by investing in affordable housing and community infrastructure. Our budget would support working Canadians by creating jobs through investments in physical and social infrastructure. At its peak, our budget measures would create more than half a million new jobs. The collective student debt load now totals $28 billion. The Alternative Federal Budget would foster a highly skilled workforce, and ease the burden on young people entering the job market, by eliminating undergraduate university tuition fees. At the end of their working lives one in ten seniors finds themselves living below the poverty line. For senior women living alone that number rises to one in three. The Alternative Federal Budget would cut senior poverty in half by increasing the Guaranteed Income Supplement and returning the age of eligibility to 65 years. We can afford to have better lives, from beginning to end. We can afford to have bigger lives with the resources already at our disposal. There is no deficit in the capacity or imagination of this country. The Alternative Federal Budget demonstrates that there is more than enough fiscal room for us all to grow. The past decade in Canada has taught us to think small and expect less. It’s time to think big and expect more. For the full Alternative Federal Budget 2016 (available in English and French), video and infographics, visit www.policyalternatives.ca/afb2016. • Alternative Federal Budget vs. Income Splitting: Who benefits?